If you’ve walked by a sneaker store in the last 20 years, chances are you saw a line of people shivering outside days in advance for the release of a limited edition pair of shoes. Whether it’s the chaotic crowds that formed for the Supreme Foamposites last year, or the murderous attempts for the Air Jordans in the 1990s, camping out for new sneaker releases has become as deeply embedded in American tradition as the Super Bowl. However, with the evolution of social media and Web browsing, camping out is becoming antiquated, a counterproductive means to securing the most elusive sneakers on the market. The resale market for sneakers, valued at $1 billion last year, is littered with insomniacs who have all the tips, tricks, and caffeinated beverages needed to round up dozens of pairs at a time, which they resell at high markups. With dozens of different premium sneakers released in the first four months of 2015 alone — including the Adidas and Kanye West’s Yeezy Boost collaboration — it’s time you learned a few tech-savvy tricks of the trade. Adidas released adidas Confirmed on iOS devices, the first footwear reservation app for its limited edition sneakers in anticipation of the Yeezy Boost release. The app allows users in a specified area to receive push notifications on their mobile device for sneaker releases and reserve sneakers. It also verifies your location in order to prevent automated bot systems from wiping the inventory clean before you get a chance to start. Finally, it gives those with confirmed reservations, information on where to pick up their shoes. Not to be upstaged by its three-stripe competitor, Nike also released its own app for its vast inventory of releases, SNKRS back in February of this year. The app will send you a push notification when the new Lebron’s are 15 minutes from hitting the digital shelves. SNKRS also allows users to customize the list of future releases they wants updated news by simply tapping on an the array of choices. Search, personalize and purchase your favorite Nike sneakers from your phone. The app is only available on iOS, but an Android version is slated to hit the Google Play Store later this Spring. The tweets are always watching, and the commercial power of the house Twitter built is never more apparent than in the sneaker world. Nike’s NikeStore Twitter account tweeted out a link to the highly anticipated final collaboration with Kanye West, Nike Air Yeezy II by surprise at 1 p.m. on February 9, 2014. Within 11 minutes all of the limited edition sneakers were sold out. Setting up your Twitter account to receive push notifications to your phone when brands’ Twitter accounts tweet out release links can be the difference between paying $245 for a special edition sneaker and donating a college tuition payment to your sneaker habit. Here are a few key Twitter accounts to follow to stay abreast of the latest releases of special edition shoes: @NikeStore, @heidiburgett (PR Director of Nike), @Jumpman23 (Official Jordan brand Twitter account), @ShoePalace (premier shoe retailer), and @flightclub (premiere sneaker marketplace). Contrary to Her, software can not read your inner thoughts and suggest how to respond to an email, but it can help you get sneakers. Bots and automated systems have proliferated in the sneaker community in recent years, and many will automatically scan a product page and/or Twitter account, and add shoes to your shopping cart for checkout. Convenience does not come cheap in the sneaker world, and these bots cost upwards of $225 on some sites. 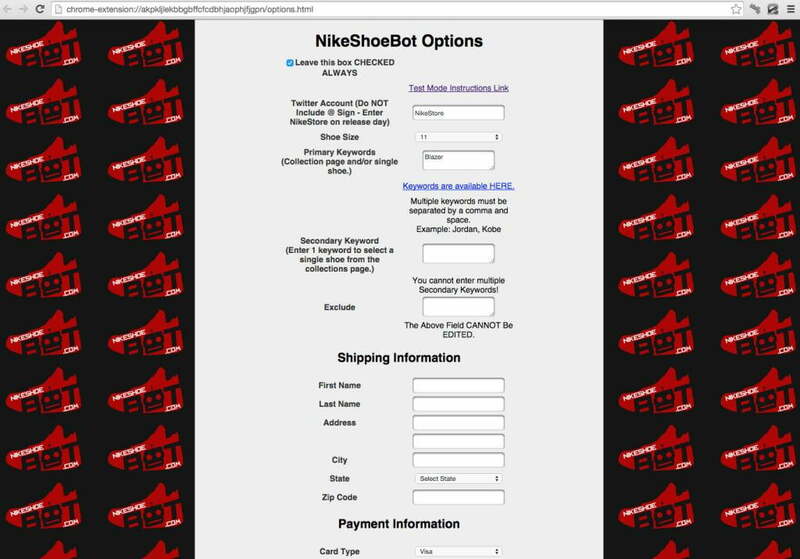 There are a variety of bots, but NikeShoeBot claims to be the creator of bots and has multiple bot packages for purchase that work as Firefox and Google Chrome extensions, as well as an iOS app. You simply download the bot, enter the name and size of your desired shoe, and finally, input your shipping and payment information. The bot secures your purchase and goes through most of the checkout process, as soon as the shoe’s release link is tweeted out. It only requires you to play Nike’s recent CAPTCHA system, and your order is complete. The Google Chrome extension Page Monitor automatically refreshes numerous specified webpages in the background, and reports back when it is updated. You can set Page Monitor to give you desktop notifications and adjust the update interval to as little as 5 seconds, so you don’t have to obsessively check if the sneakers were released in between every eye blink. The style code for upcoming sneakers such are normally released months in advance, either on the company’s website or sites such as Sole Collector. Searching for the style code of future releases on company’s official sites will usually yield no results. However, click Monitor This Page on the Page Monitor extension, and seconds after a purchase link for that sneaker appears on the site, Page Monitor will let you know. You will have to be aware of the time the sneakers are scheduled to be released and have all your purchase information ready for when those kicks become available. This is perfect for when multiple sneakers are being released on the same day, like the Nike Dunk High CMFT Premium “All Star” and adidas Ultra Boost, which both dropped on February 11. Popular sneaker news website KicksOnFire provides a comprehensive and regularly updated list of new releases from all the major brands to help you with your sneaker quest. With Nike and Adidas beginning serious initiatives to bolster their online sales while precluding any gaming of their systems, there will be sneakers to buy for those with these tips.